Jimi Hendrix Guitar Signature Licks Volume 2 PDF + Mp3 CD download. A Step-by-Step Breakdown of His Guitar Styles and Techniques (Guitar Signature Licks). Chad Johnson teaches you the riffs and solos for 12 Hendrix songs, including ‘Third Stone from the Sun,’ ‘The Star-Spangled Banner,’ and ‘Dolly Dagger.’ Note-for-note transcriptions and TAB. Anyone looking to expand their horizons on Hendrix should pick this one up. Learn to play 12 more greatest Hendrix’s songs. Listen to music, follow the tabs and play like your favourite musician. The Signature Licks Series features book and CD packs and DVDs specially designed to teach a musician the trademark techniques of popular artists and musical styles. Each package features an in-depth breakdown of the riffs and sounds unique to the band or artist: the sounds which have led the band or artist to be recognizable by their own signature sound. The Signature Licks Series is an excellent resource to learn what makes for a unique sound as well as help you develop your own. 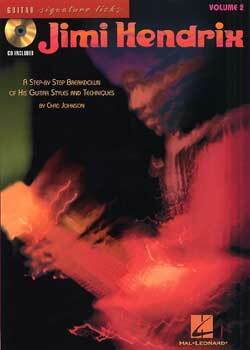 Download Jimi Hendrix – Guitar Signature Licks Volume 2 PDF free and other books from our site. Only high quality PDF scans. Please write a review, it's important for our community.